2. OD wool shirt - They wore khaki in the summer but around November they change to the OD wool for their field shirt. 4. Service Boots - Russet brown ankle boots with toe cap. This looks exactly like the paratrooper jump boots except it's ankle length. You can substitute the jump boots since it will be covered by the khaki leggings. 5. Leggings - (army issue 8 hooks/17 holes) Note: Navy/Marine corps usually have only 6 hooks/13 holes - do not get these. 6. M1 Garand rifle - Contrary to popular belief, they did not use 1903 Springfields in Bataan. The combat units of the Scouts (45th Infantry, 57th Infantry, 26th Cavalry, Combat engineers) were issued M1 Garands in 1941. The artillery, and other auxilliary PS units may have used the 1903. 7. 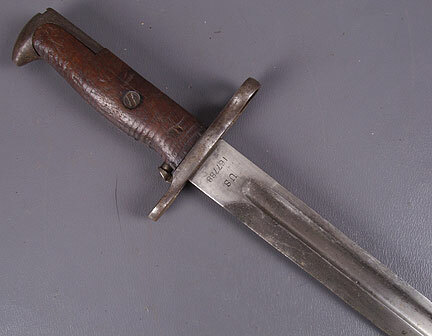 M1905 bayonet - This has the 16" blade with wooden handle panels. I've seen early war army combat units with soldiers wearing a mix of the M1924 and the M1910 first aid pouches. They threw out the gas mask and used the bag to carry grenades, ammo, and food. This is the basic enlisted PS infantry. The cavalry is slightly different. French Militaria magazine of a Sgt. Philippine Scout. Boots used not quite correct issue used for non-com here. should be lacedd on him. Col. Ed Ramsey told me through email correspondence that the 26th cavalry enlisted men wore the 1931 lace up boots but that officers varied between the regular officer's boots (no laces nor buckles) and the 3-buckle boots shown in that picture. Glad you caught the fact that Philippine Scout combat arms used the M1. The 31st Infantry did, as well. The 4th Marine Regiment, which arived from China shortly before the start of war, used the M1903, as did other units. The Philippine National Army mostly used the M1917, as you probably know. got a couple of questions here guys - did the PS use any expendable Cotton Bandoleer in Bataan or anywhere? 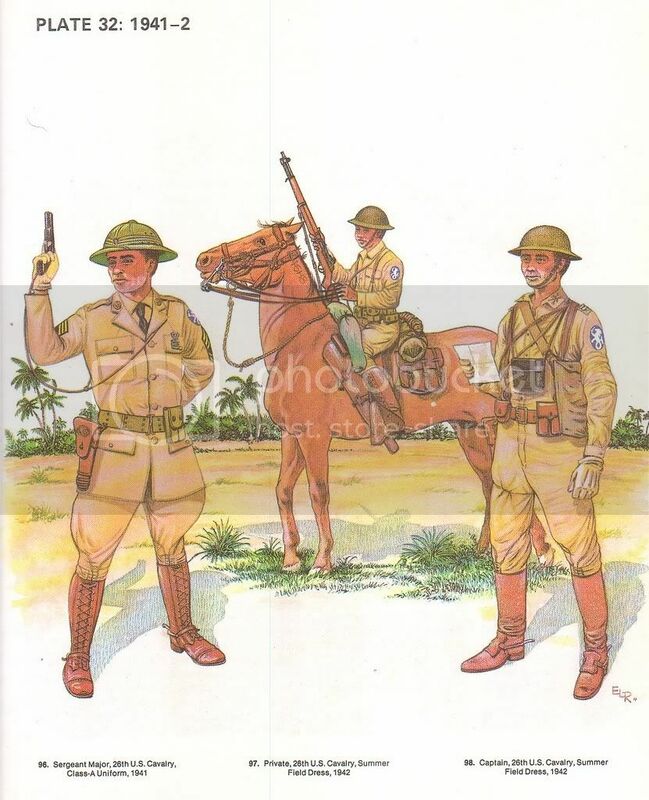 Did the American officers of the PS also use the PS 'carabao head' patch on their shoulder? if not, what did they use, their old unit patch? and Vee, can you make this thread -sticky? I haven't seen pictures of PS wearing them, but there are so few pictures of them and not in actual combat (when they would have actually used those cloth bandoliers). However I've come across references to them in books. 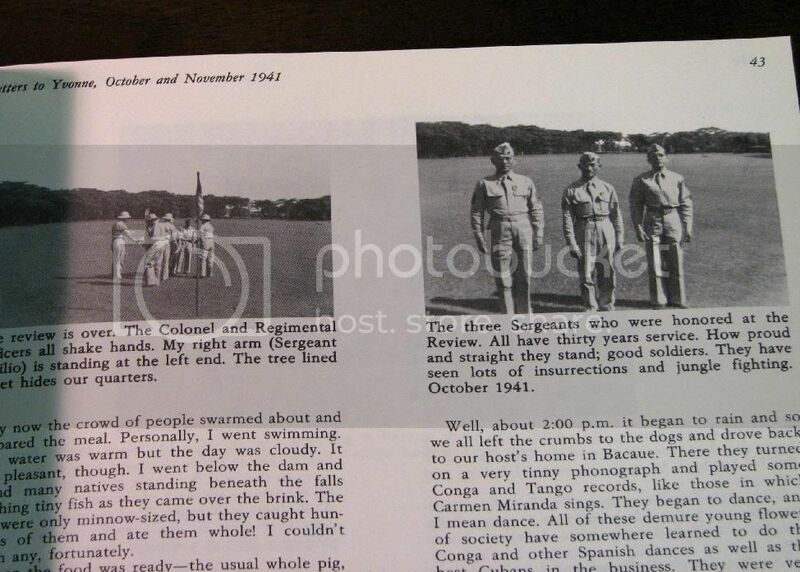 One particular mention was in the book Baby of Bataan. The author was a motorcycle messenger from the American 31st Infantry and was only armed with a service pistol. He and another companion got separated from their regiment during the retreat from Layac to the Abucay line. They stumbled upon the 26th Cavalry who were also trying to get back into allied lines. They provided the author with a rifle and bandoliers of ammo. After wearing the bandoliers criss-crossed around his chest, the scouts teased him for looking like Pancho Villa. Yes the American officers would have used the same patch, including the American 31st Infantry Regiment. They were all part of the "Philippine Division". The carabao patch was not specific to the Scouts. It was the patch of the Philippine Division (which became the 12th Infantry Division after the war). A little disclaimer though: I haven't seen any photos of the PS wearing the patch in their field or combat uniforms, only in their Class A's. However some of us claim "educational or commemorative license" by wearing the patch anyway in view of the reason why we put on the uniform for public events. A lady in the Reading event whose father was a PS vet approached me after noticing the patch I was wearing. We had a good conversation about her dad and she was very appreciative of the representation in the event. If I hadn't had the patch on, I'd have missed the opportunity to honor a PS descendant. I have talked to a some vets that say they used the cloth bandoliers. The 4th marines used them in Bataan so they were probably issued to the the Army as well. As the Army always got new gear ahead of the Marines. Well I'm not saying for sure they didn't wear them on their shirts. I just haven't seen a "field" photo of them with patches on their shirts. Maybe we should ask one of the vets. Could you not have found a harder picture? haha Good luck. The earlier the rarer because of issue . Here is my dad's period and it is of the first issue felt on felt. We do not know if it his but has been around a long time. 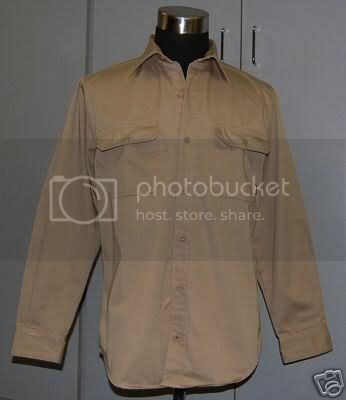 Another khaki shirt that can possibly be used instead of the Dickies brand is the Craftsman long sleeve work shirt. It's in the same section as the Dickies brand in Walmarts/K-marts. I noticed that the Dickies brand these days have a more greenish tint to it and the material is while strong is the thin type. When I looked around at a local K-mart, I saw the Craftsman brand (picture below) with the sun-tan khaki color and thick fabric. You just have to take out the brand tab attached to one of the front pockets. The same brand's pants has a side pocket that rules it out for reenactments though. I found some real khaki dickie on the internet that they still sell. I too noticed the greenish color and i looked up someone that sells them online and they had them. She even went out to the warehouse to make sure for me. I only bought one should have gotten a couple. I want to have some 57 and 45th stuff around to fill in when I can for the boys if needed. Will sew a patch of PI Dividion and the PI department on each to be ready to go. Oh cool. So they're still available online. I have a couple of original shirts but I just thought that if we're going to shoot some more reenacted scenes for Donald's documentary, I'd like to age and weather the uniform. Plus we could shoot some low crawl and other down and dirty scenes. I don't want to do that to my originals. So I'm keeping an eye out for cheap expendable khakis. You like the painting? My dad made it. He majored in fine arts at the University of the Philippines. He's visiting and I persuaded him to make a series of these military art. His forte is usually landscape, still life, flowers, seascapes and anything nature. Wow your dad. How about asking if he will commision a picture for me. My picture on the horse but i will send a photo of my dad in his twenties to maybe fit that in. Possible? The horse pic that you put in the book. Will try and remmebr who I bought those from but just type in dickies for now and see what comes up. He said sure... but it depends on your dad's photo if it's clear enough or not. If you email me a high res scan of his photo(s), I'll show my dad and he'll give us an opinion if there's enough to work with. What size do you have in mind? Very nice painting by your Dad Vic! Thanks for the info on those Craftsman shirt. Will check on them too. Sir Veevee I'm fairly new to re-enactments and still to buy my load outs. I'm here base in U.K. 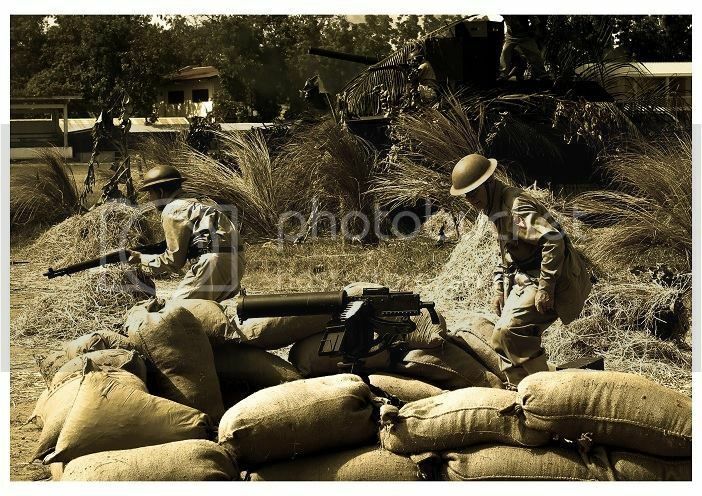 I've been playing Airsoft for quite sometime now and now venturing to new grounds, WW2 reenactments. I came across USAFFE site in google and decided to do a complete kit of a PS. In doing so I hope that our brethren here in Europe will be informed that yes we Filipinos did fight the Axis of Evil of WW2. By wearing my uniform I hope I can generate interest and promote the bravery of neglected Filipino Veterans. Thanks for your exhaustive list. I do hope I can PM you guys in guiding me or post here in completing my gear and enlightening me on all things PS. Kamusta Kana dyan sa England? Welcome to our little forum! Just let us know how we can help you exactly. WE all here will be more than eager to help fellow Pinoys who have a passion and are trying to get started on their PS impression specially from the other side of the pond. It all depends if you are after the originals or repros. Cheers! Thanks for the prompt reply...wow ambilis..Salamat ng marami. My forte really is Philippine History, Philippine-Spanish War.I'm a Magdiwang. Next year I'm planning to join Comrades In Arms, a WW2 Airsoft group here. I initially decided on 101 Airborne load outs, then I found out this site and from then on PS na and I'm very excited and looking forward in completing my gears and wearing it here. I know I will get a remarks to some purist here because our gears seems to be a mix and match of what ever available at the time. Correct me Sir if I'm wrong. Sa gears, uniforms and webbing as much as possible kung makakuha ako ng orig why not. Sa Tommy helmet orig sana, since dito ako I hope marami akong makukunan dahil if I'm not mistaken the Tommy helmet that we used was very close to the Brits? And also a uniform (where can I find the post here?, your "little" forum was huge.I'm very impressed)that I can use in Swing Bands Party, I'm a Jazz fan Sir, Specially Swing Bands, Glenn Miller, Vera Lynn. I have to learn Swing na, Nestor de Villa Style. More of an officer uniform not a battle one. As much as possible lahat wool or cotton none of the materials na never been invented during the era. Salamat. Hope in the future I can contribute here and join you there in the States, who knows. P.S. Sir can I used the Airborne 101st Corcoran Brown Boots. I know medyo mahaba ito I was thinking since mako-cover naman ito ng patts/gaiter so it will be fine?